San Marco Residences make it possible for owners and guests to enjoy the most beautiful sunsets on the Gulf of Mexico right from their units. Built on 1980 and located at 291 Collier Blvd., this condo complex has a near beach location and it’s just right across Marriott Beach Resort which has a lot of fine restaurants. By staying here you have quick and easy access of the beach because the Marco Island beach path is just right in front of the building. Where is San Marco Residences? Monthly maintenance fees for San Marco Residences condos is $435. The maintenance fee includes master insurance, cable TV, lawn maintenance, landscaping , manager , pest control , reserve , security , trash removal and water & sewer. Unfortunately we have No-Pets policy in San Marco Residences. The minimum rental period in San Marco Residences is 1 day. 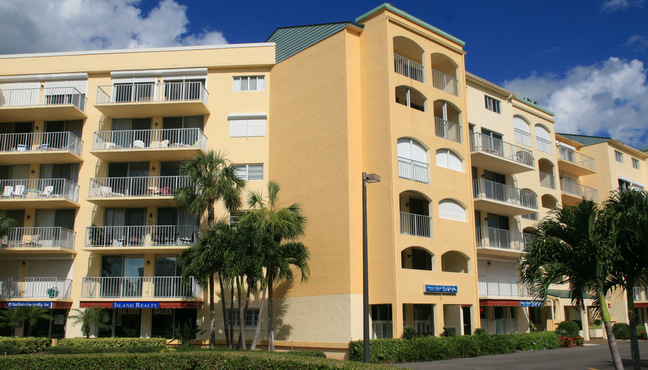 A perennial favorite, San Marco Residences condos are very easy to rent all season long. There are four different floor plans in San Marco Residences. There are both one-bedroom and two-bedroom plans. Click here to see all San Marco Residences floor plans. Shelling or shell collecting, dolphin watching, and strolling and burying your toes in the fine white sands of the beach are just some of the activities you can do while staying at San Marco Residences. If championship golf is your cup of tea, it’s just a few minutes away just like the boutiques and restaurants of Naples. From this Marco Island Florida real estate, everything the island has to offer is within easy reach, whether you’re into outdoor sports or into more leisurely activities. Whatever you’re into, San Marco Residences is sure to meet and exceed your expectations and so much more.